How does a minority of revolutionary socialists win over large sections, and eventually a majority, of working people to the need for revolution? This is the big question which has faced socialists historically, and which is once again raised by the deep crisis of capitalism and the growing radicalism of large numbers of workers. The revolutionary tradition which grew up around the Russian Revolution of 1917 used the central tactic of the united front to bridge that gap. The united front is a means of getting revolutionary ideas across to much larger sections of workers with the eventual aim of persuading them to break with reformist ideas and organisations. Revolutionaries strive to achieve this partly through their ideas, but also, crucially, through uniting with other workers in day to day struggles on specific issues. Lenin first developed the strategy during the Russian Revolution when the right wing General Kornilov attempted to overthrow the tottering government of Kerensky in August 1917. Although the Bolsheviks were being persecuted by Kerensky, Lenin didn't hesitate to call for an alliance between themselves and their oppressor. The Bolsheviks didn't hide their political differences with Kerensky--they advanced political demands as a precondition of their support. This united front led to the collapse of Kornilov's coup, as a direct result of which the Bolsheviks were able to win a majority in the soviets throughout Russia. But by the early 1920s international capitalism had weathered the revolutionary storm that swept across Europe. In a series of deepening economic crises during the next two decades the ruling classes not only repulsed the workers' offensives, but launched offensives of their own. How could these attacks be resisted? The European Communist Parties were mass organisations, but nevertheless minorities. Millions of workers continued to support the old reformist Labour parties or the newer 'centrist' organisations which vacillated between reform and revolution. The revolutionaries believed that the majority would only break with reformism if they discovered through their own experience that the existing organisations were unable to repel the employers' offensive and defend the gains achieved by workers. The key question was what joint action would most clearly express the unity the most conscious workers wanted. The united front meant building a campaign over a specific issue, for example, wage cuts or rising unemployment, putting forward demands, usually defensive, that workers from different parties, and also non-aligned workers, could unite around in practice. The test of practice would convince reformist workers that the ideas and arguments were correct, and that the official leaders were not serious about fighting for those demands. The united front also had to be organised around specific limited issues. It was not about submerging real and important political differences, for example, about the nature of parliament. It was about uniting in action. According to Trotsky, it followed from the limited nature of a united front that revolutionaries should not demand in advance agreement on the whole revolutionary programme from non-revolutionary workers who only wanted a broad fight on specific questions. Revolutionaries could only win reformist workers to their ideas by involving them in common action. Hence they should only suggest action on agreed issues. Trotsky emphasised the need for a united front to be between organisations of comparable size. The different partners must deliver something, however small, to the joint campaign, which means they must represent genuine forces, not statistics on paper. So, when the Labour Party was in opposition, it would have been a meaningless gesture for the SWP to call for a united front with the party as a whole. The disparity in size and influence would have made it appear less a genuine strategy than a self publicising manoeuvre. On the other hand, a proposal for unity with the Labour left or its former adherents, say over the fight against fascism, did make sense, as happened with the Anti Nazi League. This was also true with the anti poll tax campaign. And such a call continues to make sense in the growing mood against big business and the policies of New Labour. A united front cannot simply be based on a formal agreement between the leaderships of different organisations. It has to focus on the rank and file, involving workers in individual workplaces or at the grassroots who feel the need to unite against privatisation, racism or the underfunding of health, education and housing. Trotsky said that the highest expression of the united front was the soviets--the workers' councils created during the Russian Revolution. In today's situation, with the decline of the old Communist parties and New Labour's sharp lurch to the right, this involves appealing to the rank and file of the Labour left and of the unions. At the same time the leaders of the reformist organisations cannot be ignored. A united struggle involves trying to negotiate with them so as to build a common platform and joint action. How did the theory of the united front work out in practice during the turbulent years of economic crisis ushered in by the Great Crash in 1929? Workers everywhere were fighting defensive battles against unemployment, wage and welfare cuts, and the growing threat of fascism. The German Social Democrats, the SPD, dithered, tolerating the semi-dictatorial Bruning regime as the 'lesser evil' compared to the fascists and waiting for the crisis to pass. Trotsky urged the leaders of the German Communist Party (CP) to seize the golden opportunity that existed to call on the SPD leadership to join them in a united front to defeat Nazism. Together the two parties counted for 40 percent of the vote, a majority of the working class who, if united, had the power to repel the forces of fascism. Tragically the CP, at Stalin's behest, adopted a sectarian, ultra-left line, labelling the SPD 'social fascists'. According to Stalin, 'social democracy, objectively speaking', was 'the moderate wing of fascism'. Already in 1930 the CP had dismissed the SPD government of Müller as 'fascist'. But if 'fascism' already existed, why the urgent need to combat the Nazis who only represented 'a different form of fascism'? German workers were regarded as having reached a revolutionary level sufficient to make a united front superfluous. Hence the CP leaders adopted the very 'ultimatist' approach to the SPD workers that Trotsky warned against, refusing to call on them to join a united front, instead demanding they fall in immediately behind the CP. The result of this strategy was that the German labour movement remained divided, enabling Hitler to take power without even a fight. In the Spanish Civil War of 1936-39, Stalin zigzagged from ultra-left sectarianism in Germany to the opportunism of the Popular Front. Here, instead of calling on the other working class and poor peasant parties to join them in a united front against Franco, the Spanish CP entered a coalition that stretched from the left to the liberal bourgeois parties. 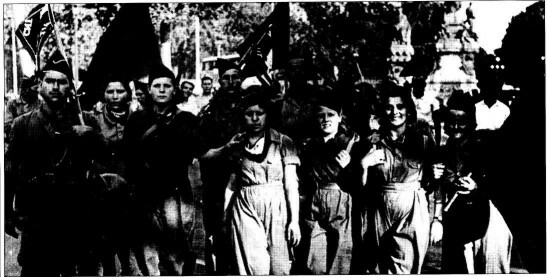 The CP made a fatal error in assuming that the bourgeois members of the Popular Front government had an interest in seriously prosecuting the anti-fascist struggle. But prior to the civil war the liberal bourgeoisie had consistently upheld landed property, the church and the army, so it was not likely that they would wholeheartedly attack these institutions in the battle against Franco. But the Republicans had no chance of winning the mass of poor peasants to the anti-fascist cause unless they attacked the property rights of the large rural landowners. They were precluded from this strategy because the big bourgeoisie, which retained strong links with the landed interests, was included in the anti-fascist coalition. In France in the early 1930s the fascists were growing but the Communist and Socialist parties refused to unite to fight them. By 1934 the fascist movement claimed 1 million members and had the confidence to attack the French parliament in an attempt to topple the liberal Radical government. Rank and file members of the CP and the SP, and also of the CGT, the main trade union federation, spontaneously linked up during a mammoth demonstration that started out as two separate marches. Two years later, in May 1936, a Popular Front government was elected, triggering the most massive strike wave in working class history. Workers right across the country occupied factories. The union leaders quickly reached an agreement conceding higher wages, shorter hours and paid holidays. The strikes were called off despite opposition from below. With fascism the Popular Front called merely for the banning of fascist organisations by the state. Even some Radicals, members of a pro-imperialist party, judged its programme to be too weak. It was an agreement between leaders who stood above the masses, who agreed to abstain from mutual criticism. In no way, therefore, was it a campaign that could unite workers, whether revolutionary or reformist, in united action. The lessons that can be learned from the historical experience of the Popular Front are currently particularly relevant to the situation of socialists in Austria fighting the neo-Nazi Freedom Party of Haider. The tactic of the united front will be of increasing importance in coming years. As workers feel the need to fight back under the blows of the crisis, and as the Social Democratic and Labour parties fail to deliver for their supporters, the need to unite to defend workers' rights will be at the centre of socialist politics.